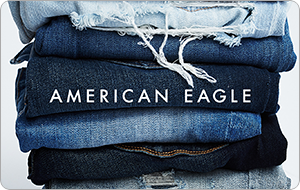 Your American Eagle Outfitters or Aerie e-gift card number may be used to purchase any merchandise online at AE.com� or Aerie.com, at any American Eagle Outfitters� or Aerie� store, or by calling 1.888.232.4535. The e-gift card cannot be used to purchase gift cards, applied as payment toward the AEO credit card, or redeemed for cash, unless otherwise required by law. All AE.com or Aerie.com orders using e-gift cards at checkout will be processed in U.S. funds. Call 1.877.274.3004 to receive your e-gift card balance. The risk of loss and title of the e-gift card pass to the purchaser upon our electronic transfer to the recipient. We are not responsible for lost or stolen e-gift cards. We have the right to cancel e-gift cards if obtained fraudulently. We are not responsible for third party purchases of e-gift cards. Purchase, use or acceptance of the card constitutes acceptance of these terms and conditions. The terms and conditions of your American Eagle Outfitters or Aerie e-gift card are governed by the laws of the state where the card was purchased. The e-gift card carries no expiration date. Issued by AE Admin Services Co. LLC/American Eagle Outfitters Canada Corporation. � 2015 AE Admin Services Co. LLC. All rights reserved.